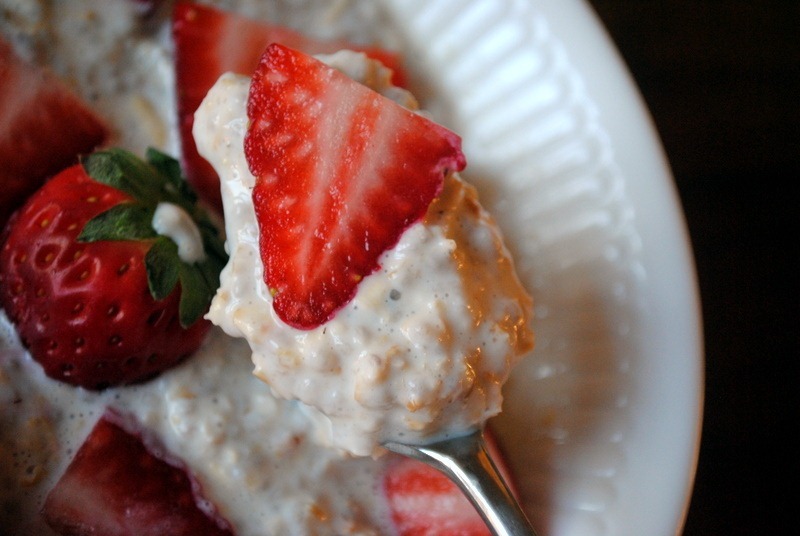 We’ll talk overnight oats in a minute, but first let’s recap today’s workout! I awoke this morning feeling rather sluggish. Yesterday’s day of rest also turned into a day of mindless eating as the night wore on, which left me feeling uncomfortably full as we went to bed. Blah. All the more reason to begin this week on a healthy note! Lately I feel like my snacks have been filled with more sugar and less nutrients than usual and my mission this week is to change that. Today’s workout was a good one. Ryan and I began our time at the gym with 20 minutes of cardio split between the stair master and the elliptical. I requested 10 minutes on the stair master and Ryan grudgingly agreed, saying that the stair master isn’t a warm up, but a seriously legit workout. It is tough and I like how it almost immediately gets me sweating. The final exercise really hammered it home for me because I took my time to do each rep incredibly sloooow. My buns were burnin’! I eat a lot of overnight oats. They pop up on this blog all the time because I think they are delicious and I love how they make breakfast so easy since all the prep work is done the night before. I tried them for the first time after reading about them on a bunch of blogs. I thought they were disgusting at first because I never made them quite right and the texture was always off. 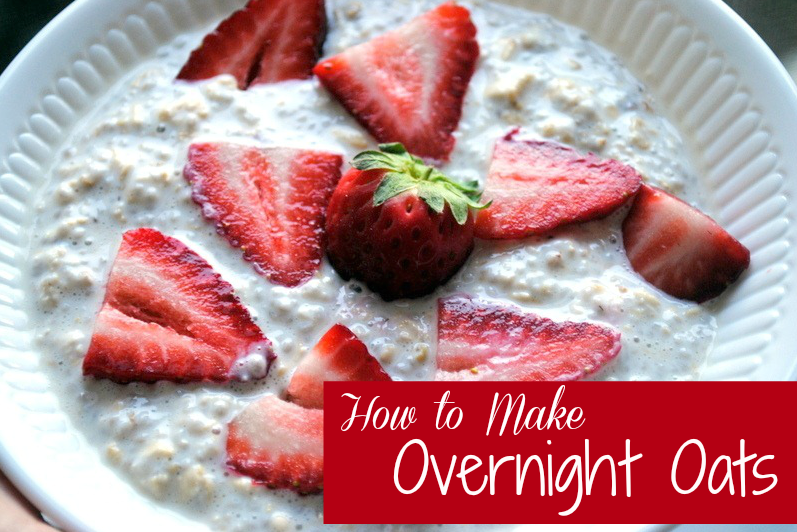 I know that there are tons of recipes for overnight oats all over the internet, so definitely check them out and try out a bunch of different recipes to find the one you most enjoy! 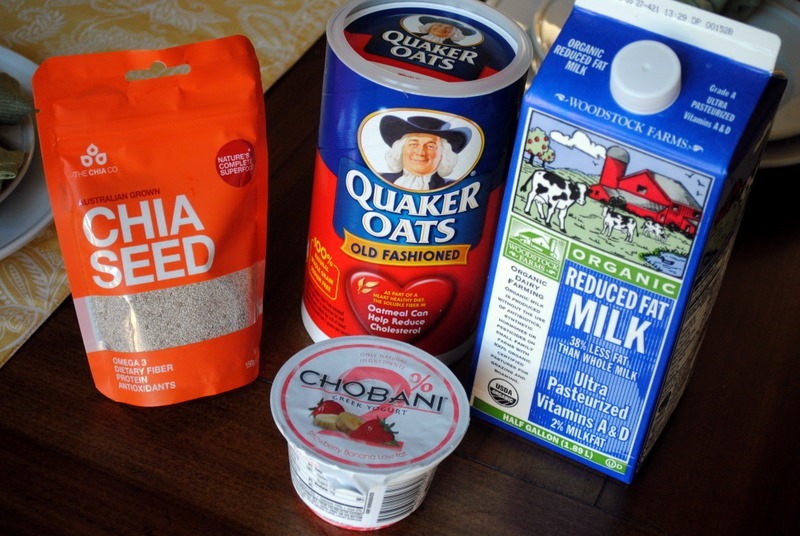 Many people make overnight oats with just oats and milk as a base, but I’ve found that my favorite overnight oats include four main ingredients. It actually took me a lot of playing around with oats, milk, yogurt and chia seeds to finally get the combination that I felt like yielded the perfect consistency and thickness. 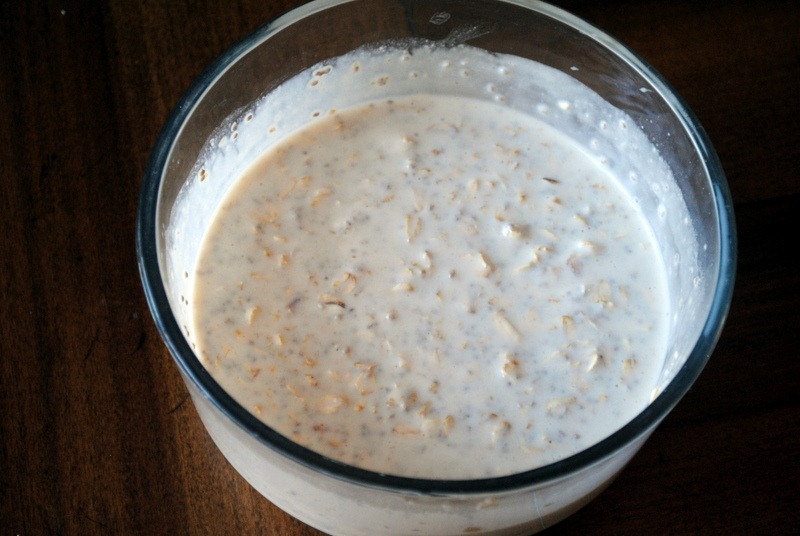 I now eye-ball measurements every time I make overnight oats, but last night I took the time to actually measure everything since I’ve received a few requests for my exact overnight oats recipe and had a lot of you comment and email me complaining about overly-liquidy oats. First, I combine one 6-ounce container of Greek yogurt, two tablespoons chia seeds, 2/3 cup oats and 1/2 cup milk in a large bowl. 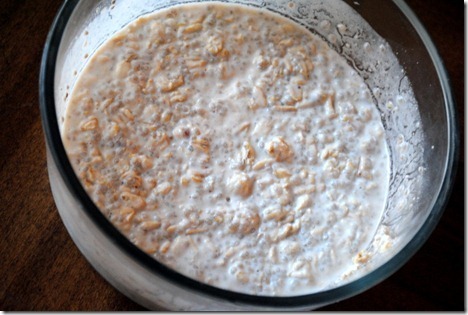 I then stir it up, cover the oats and let them sit in the fridge overnight. 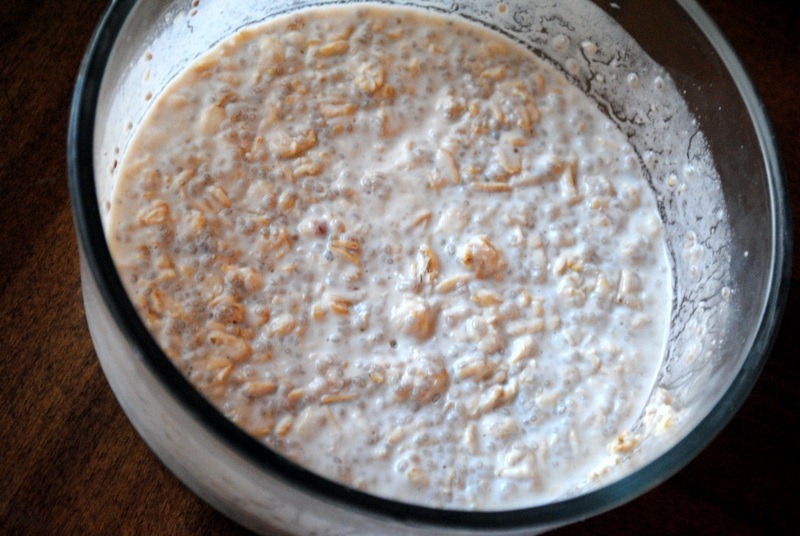 In the morning, I stir the super-thick oats and add in another 1/4 cup of milk to make everything slightly more liquidy, but still quite thick. Then it’s time to top the oats with fresh fruit, nuts or nut butter and dig in! 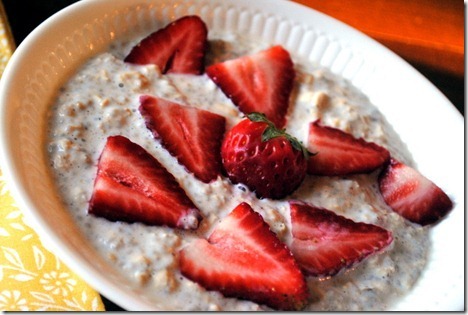 To me, the key to my favorite overnight oats is the inclusion of chia seeds. These cannot be substituted because they add thickness to the oats that simply cannot be duplicated. If you do not have or do not like chia seeds, you may wish to reduce the amount of milk in the overnight oats to maintain thickness. 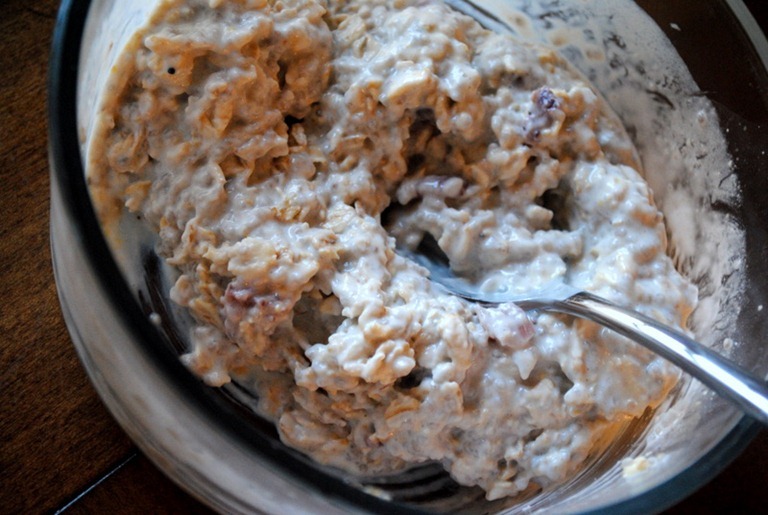 If I am using plain Greek yogurt, I will add about one tablespoon of honey or fruit preserves to the oats before letting them sit overnight for a bit of sweetness. What is your favorite way to make overnight oats? Feel free to link to a favorite recipe! Tried my first batch of overnight oats this morning…I accidently got the Microwaveable (1-minute oats), and not sure if that is much different from the old fashioned, but followed the above directions and it is very tasty, but very thick. 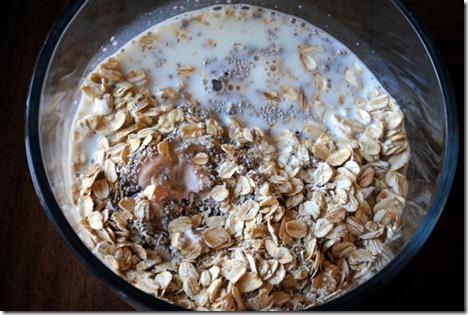 I think I’m going to try this again tonight, but add another 1/4 cup of milk to get the consistency right. Very filling and extremely healthy meal! Kudos for posting this PBF! That looks so incredible! 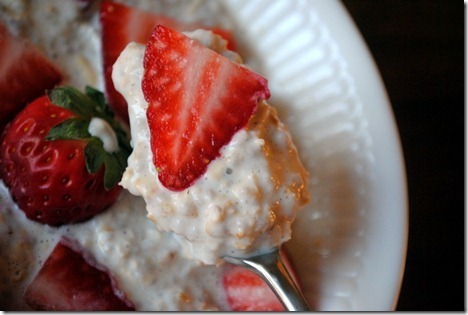 Overnight oats are delicious. I’m always curious which yogurt people like to add to it. Have you ever tried adding a flavored yogurt, like strawberry yogurt? I bet that would be delicious! Love your blog, I always read it on my phone during the kiddo’s nap time! 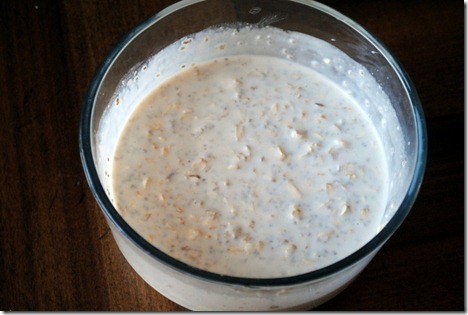 I have heard of so many failed attempts at overnight oats without chia seeds but mine always come out just fine! I’m sure chia seeds have lots of health benefits and all that, but I just can’t get over the fact that I would be eating the same thing I used to plant in my Chia Pet — or that they are $10 a bag around here. 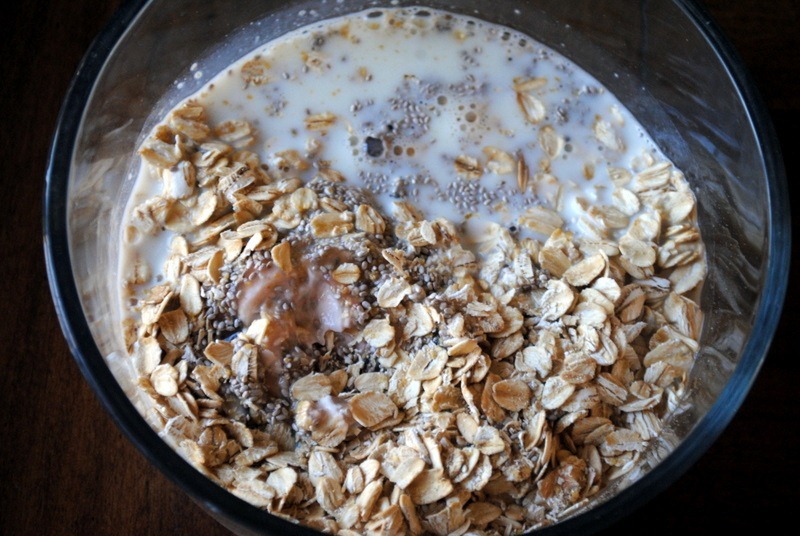 🙂 I follow the proportions in your recipe, using 2/3 cup quick oats, 3/4 cup yogurt (Greek makes the mixture thicker, but I’ve found regular yogurt works as well), and 1/2 cup milk (I use almond), and my overnight oats always come out extremely thick! I think it’s the difference between old fashioned oats and quick oats. 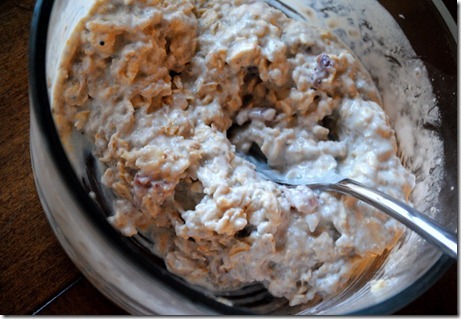 Typically I try to sweeten my oats with just a little bit of Ovaltine/Carnation Instant Breakfast (chocolate overnight oats are my favorite!) or a really ripe smashed banana, but generally I just short-cut it, don’t worry about the added sugar, and use flavored yogurt right from the start! Blueberry, strawberry, and even coffee flavored are really good, and I never get tired of oats when there are so many flavors of yogurt to choose from these days!